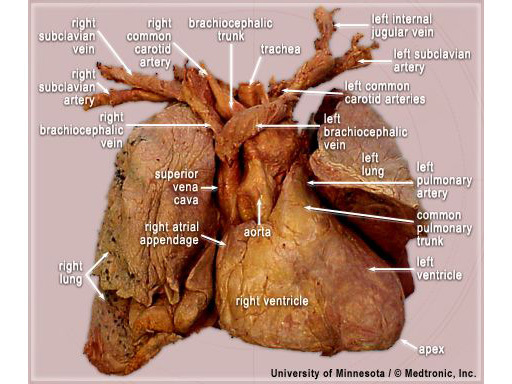 Anterior view of a "Heart-Lung Block" removed from a fixed cadaver. The subclavian veins and arteries were kept intact connected to the great vessels of the heart. This heart was enlarged and displaced the lower lobe of the left lung. the heart is positioned in the chest with 2/3 to the left of midline and the inferior aspect is resting on the diaphragm. The apex of the heart is pointing inferiorly and to the left. The media in this section display the epicardial surface of the heart viewed either from the anterior, posterior or left and right oblique aspects. Some of the media displays the heart in a valentine position, with the long axis of the heart sitting in the vertical plane. The rest of the images and videos display the heart orientated in and attitudinally correct position, as the heart would be viewed in the body, see anatomy tutorial for more information. hypertrophic and dilated cardiomyopathies often alter the global structure of the heart due to the heart changing size and shape during the progression of the disease. Understanding how the heart is positioned in the body and therefore where the relevant structures are is critically important for cardiac surgery and bypass procedures. epicardial pacing leads placed on both the atria and the ventricles will often be used during trans-apical procedures and after bypass surgery to control tachyarrhythmias and improve hemodynamic function in the presence of arrhythmias.